Alphonse Mucha was a talented painter and graphic designer who lived from 1860 to 1939. He was born in Moravia (today part of the Czech Republic) and later studied and worked in Austria and France. While he was in Paris, he became famous for his posters and illustrations advertising theatrical and operatic performances and products such as chocolate, pastries, bicycles, and perfumes. Mucha invented an entirely new style that featured beautiful women in flowing garments surrounded by flowers, foliage, and other graceful decorative motifs—a style that became known as Art Nouveau. In this coloring book you’ll find 22 line drawings of Alphonse Mucha’s artwork. The drawings are based on the original color posters and prints shown on the inside front and back covers of this book. 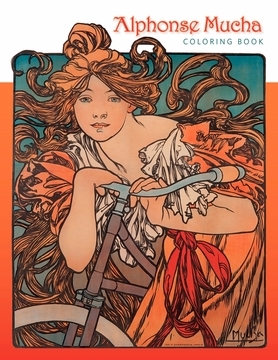 When you color in the drawings, you might enjoy using the colors that Mucha used, or you might have fun choosing your own. 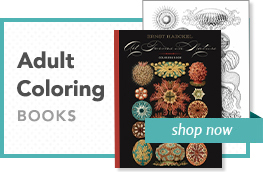 We left the last page of this book blank so that you can draw and color a picture of your own—maybe you’ll create your own poster, invitation, or book cover in the Art Nouveau style! Tête Byzantine—Brunette (Byzantine Head, Brunette), n.d.